Today I saw an article on YOU Magazine’s website, about the death of ‘Get me to 21’ organ donor campaigner Jenna Lowe. Sadly she did get an organ transplant at the end of last year but still passed away. On Facebook, below the article link many commented along the lines of “so sad”, only 2 said that they are organ donors. Despite the fact that Jenna did get a transplant, and it was unsucessful, I feel that the most fitting tribute to her would be to do what she asked people to do and sign up as Organ Donors, with the organ donor foundation. Social media makes it so easy for us to pontificate, without taking any action in the real world. Here is an opportunity to do something great from the simple comfort of your keyboard. 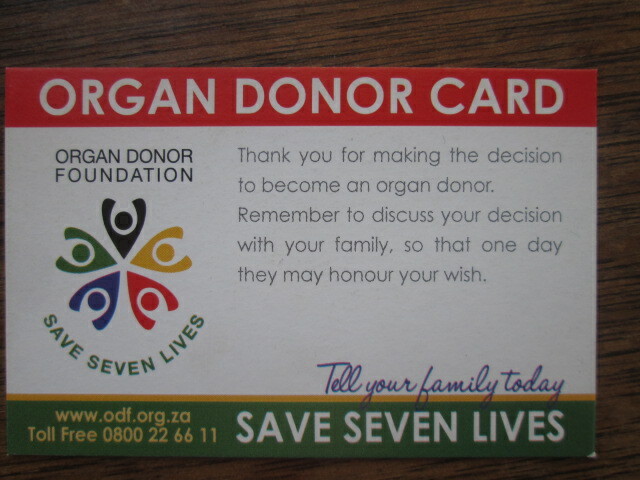 Assuming that the Post Office do their part (In my case the post office took 9 months to deliver), you receive an organ donor card by mail, along with red stickers to place on your drivers licence and ID document. Tell your family and next of kin about your decision. Go on don’t just comment, DO SOMETHING! Do something, to honour Jenna and potentially save 7 lives. I’m an organ donor and have informed my parents that if my organs can be used to save a life after my death, then they must ensure that this happens. Thanks for creating awareness Sula.